We all know that the key to airbrushed makeup that lasts all day long is putting in the groundwork. A good primer does for your skin what Shapewear does for your figure – it smoothes, flatters, conceals and holds things in place. Primers are designed to create a barrier between makeup and skin, plus provide something for your makeup to ‘hold on to’. Many people often skip this necessary step because they believe they don’t really need it. In my world, I always apply a primer under my foundation. I own a number of different primers that all serve different functions – mattifying, anti-aging, pore minimising, illuminating, correcting, and even bronzing. When this little tube from GOSH arrived on my doorstep the other day, it was just what the makeup doctor ordered because at this moment my skin is very dehydrated (thanks to the cold & dry weather we’ve been having) and I need all the help I can get! 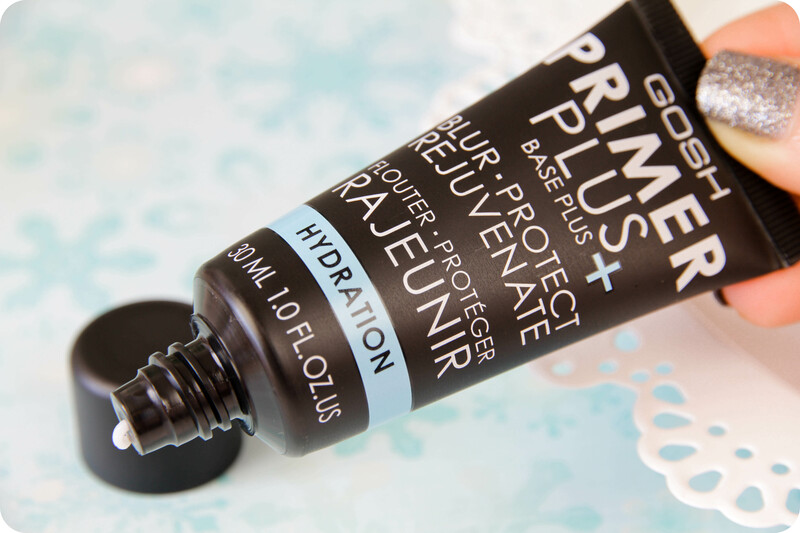 GOSH Primer Plus+ Hydration is the latest addition to the GOSH primer collection. This hydrating makeup primer promises to rejuvenate, protect and hydrate your skin whilst blurring out any imperfections. It contains snow algae to safeguard the skin’s youthfulness. The most important thing to remember, is dehydration does not necessarily mean your skin is dry. I have combination skin (oily T-zone, with dry cheeks) and beauty therapists are always telling me my skin is dehydrated. When your skin lacks water, it is dehydrated. When your skin lacks natural oils, it is dry. A hydrating primer not only helps foundation glide on and stay on, it also infuses skin with lightweight moisture, so it feels comfortable & plump all day long. The very first thing I noticed when I applied this primer, is that it felt really moisturising, almost like a lightweight daily moisturiser rather than a primer. It feels refreshing and cooling on the skin and absorbs quite fast, leaving my skin feeling super soft and velvety. This primer is perfect for this time of the year when skin tends to feel tight. I can also imagine this primer being a year-long favourite because in the Summer months, my skin tends to look and feel parched from being out in the sun. The result? 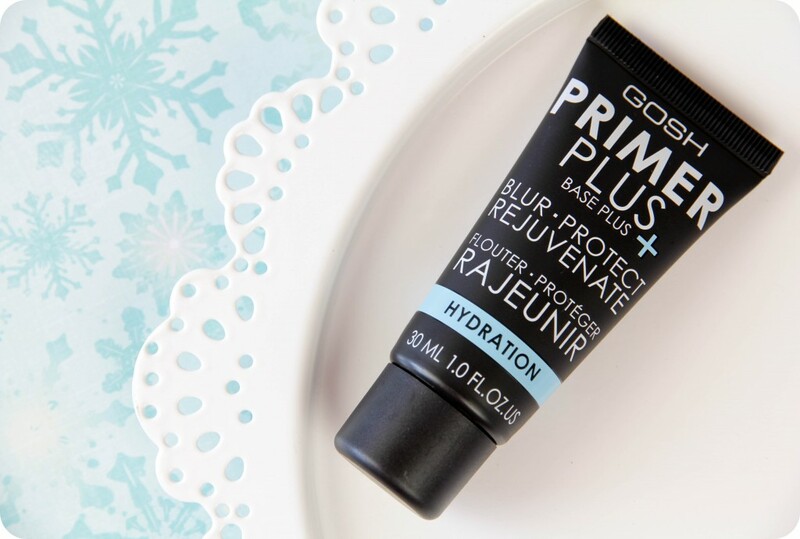 GOSH Primer Plus+ Hydration gives my skin a soft-focus finish and silky texture. I can wear this underneath a full coverage matte or drying formula foundation (like the MAC Studio Fix foundation), and it ensures the product glides on effortlessly without clinging to dry patches. I’ve also tested this with a dewy finish foundation (Max Factor Skin Luminizer foundation) on top, and find it controls oil quite well too. In saying this, though, it doesn’t mean it is on the level of a heavy duty matte primer but it did do a decent enough job. I would say this primer is suitable for normal to dry, and even combination skin types. The GOSH Primer Plus + provides just enough tackiness to allow my makeup to adhere to it and helps create an even canvas for my foundation. I have also used this under the eye (I have a very dehydrated under eye area) and it helps my concealer stay crease-free. It’s a great multi-tasker: It hydrates and smoothes over dry areas, and keeps your concealer and / or foundation lasting all day long. Does it blur pores and imperfections? On me, not really. It does smoothen out fine lines ever so slightly, but I wouldn’t say is fills in my pores. If you have crater-like pores, then I would suggest you give this primer a skip. But if your skin feels tight and looks dull, and you are on the hunt for a new primer, then check this one out – it really does feel lovely on the skin. Top Tip: Less is more when it comes to face primers. No need to overload on the stuff, because it will pill under your foundation. A small pea-sized amount is plenty. GOSH Primer Plus + Hydration retails for R 210,00 at Edgars & Red Square stores. This is exactly what my skin needs now! Ek gaan definitief ‘n draai maak by Red Square, dit klink of dit baie lekker voel op die vel. Jy moet ‘n lekker naweek hê, Luzanne! I use the Smashbox Hydrating primer which is just heaven for my skin, I wonder how this would compare to that, as it’s a LOT cheaper! This primer sounds like good value for money and I will definitely give it a try. I love the Smashbox Primer…got a sample once, but really out of my budget, so I’d try something cheaper for now. Had to lol @ crater-like pores….LMAO. You sure have a way with words! Have a good weekend! Long weekend…..yippee!! Yes, unfortunately the Smashbox primers are a bit more expensive – they’re great quality (their Pore Minimizing one is still my ultimate favourite primer) but the price isn’t for everyone. WHAT?! It’s long weekend? No….how did I NOT KNOW ABOUT THIS!? Oh my god, I never even knew there was a difference between dry and dehydrated skin. Thank you for explaining, Luzanne. I have just learned something new from you. I always thought my skin was confused because it’s dry and oily but now I know it is actually dehydrated. Once again I learned something from you, the difference between dehydrated and a dry skin, thanks a lot for the info! If you want something to help with pores, try the Palladio herbal primer! It feels so satin-like on the skin! Ek kan nie wag om te hoor wat jy van POREfessional van Benefit dink nie. Het jy al ooit die Body Shop s’n probeer?